Wi-Fi might not be the first thing that comes to mind when considering critical capital expenditures for residential care and assisted living facilities, but it is becoming an integral part of operations as technology evolves. As large segments of our population continue to age, the demand for Wi-Fi in assisted living and continuing care retirement centers grows. Tech-savvy seniors expect to use wireless Internet access. According to a 2017 Pew Research study, 67% of seniors age 65 and older indicated they go online. A Link-age 2016 study showed just over 40% of seniors own a smartphone and state their top communication technology uses include Internet access, wireless networks, and personal computers more than other technology. Assisted living facilities will need to keep their Wi-Fi access competitive to attract future residents. Facility-owned computing devices, such as tablets and laptops used by management and facility operations staff, also require Wi-Fi access. The staff network must be HIPAA-compliant, incorporating security measures to keep patient records secure, especially when accessed in the course of day-to-day routines. While both resident and staff use are necessary, the real power of Wi-Fi in assisted living facilities lies in infrastructure. The Internet of Things (IoT) is evolving to produce an ever-growing array of wireless sensor technology that is used to monitor residents, improve operational efficiencies, and maintain health and safety. The capital investment in Wi-Fi for a facility can be considered primarily one of infrastructure, since every day, Wi-Fi becomes an increasingly critical component of daily operations. Health monitors: Track vital signs, blood pressure, pulse rate, and temperature. Orientation: Wrist-worn devices transmit position including sitting, standing or lying down. Location: Where are your residents within your facility? An absolute essential for Alzheimer’s or dementia residents. Pressure sensors: Monitor beds, chairs, and floors to track patient activity. Environmental sensors: Measure and adjust room temperature and humidity. Motion detectors: Monitor visitors, and help determine if the patient is following normal activity patterns. Lighting & electrical sensors: Automatically turn on and off to ensure safe movement, appropriate lighting day or night. Safety: Heat, smoke, and carbon monoxide detection. Voice activated devices: AI personal assistant devices like Amazon Echo and Google Home provide a quick way for seniors to summon help. Location sensors: GPS tracking for drug carts, medical devices, and other facility assets. Security monitors: Motion sensors, access control, and video surveillance. Safety sensors: Heat, smoke, and carbon monoxide detection. Lighting & Electrical: Automatic lights conserves energy, high-energy devices connected to sensors can be remotely shut down to save. To take full advantage of these critical applications, a properly designed and functioning Wi-Fi system is essential. If your wireless doesn’t work correctly, your critical applications won’t work efficiently either. First and foremost, every Wi-Fi deployment must be tailored to the facilities’ specific layout, building materials, and constraints. This will ensure proper coverage on both the 2.4 GHz and 5 GHz bands by selecting the correct locations, channel, and transmit power settings for access points. In a facility serving hundreds of residents, such a system needs to be engineered and optimized for the space. This requires qualified and knowledgeable Wi-Fi engineers and installers. The access points should be centrally managed by either an on-site controller or a cloud-based application to ensure the proper monitoring of functionality and usage statistics, and that changes are rolled out consistently and universally. The EnGenius Neutron platform is ideally suited for assisted living Wi-Fi applications for several reasons, including ease of centralized management, durable leading-edge access points, and reasonable costs. Compared to the 5 GHz band, the 2.4 GHz band has comparatively low throughput and is subject to more external sources of interference, though data also travels further and attenuates less rapidly on 2.4 GHz. This is also the band preferred by IoT and medical monitoring devices and sensors, and will likely remain so for many years to come. The 2.4 GHz Wi-Fi technology is older and costs less for embedded device manufacturers to incorporate. While the data requirements per device are minimal, most medical monitoring devices only need to report small amounts of data. 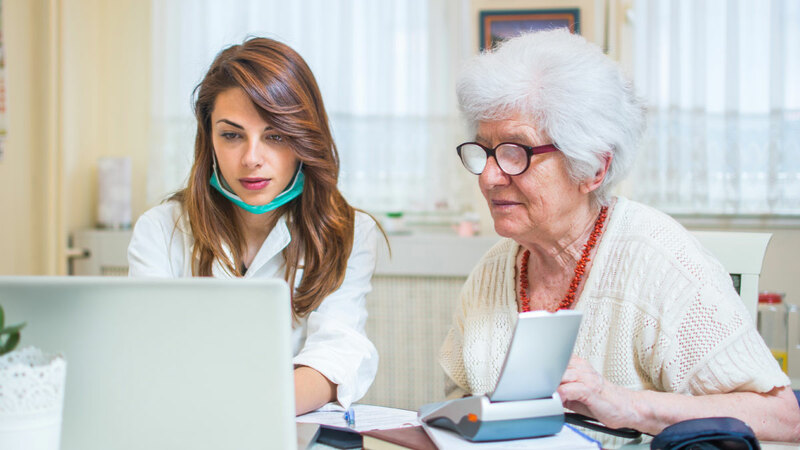 Naturally, we wouldn’t want medical monitoring devices to compete for wireless resources with high data applications such as video conferencing on Skype or accessing patient medical records on an employee’s tablet. Fortunately, most devices are already capable of operating on either the 2.4 GHz or 5 GHz bands, and enterprise APs include Band Steering to encourage connections on 5 GHz. This band utilizes wider channels and is subject to less external interference than the 2.4 GHz band. This is the network for facility residents, their guests, and any personal devices brought in by staff. The SSID should be unencrypted to allow for easy access to the network. However, client devices should be completely isolated from one another, so they can only get Internet access and not access to each other. It is also important to use a well-designed captive portal for guests and enforce bandwidth limitations per device to prevent abuse. This VLAN is the network for facility-owned computing devices, such as tablets and laptops for both resident management and facility operations. The network incorporates WPA2 Enterprise security with a central RADIUS or Active Directory server to meet HIPPA-compliance and to manage the users and devices that can log onto this network. This network supports the array of IoT sensors and actuators used to monitor residents and measure/control the environment. Since much of the data will be patient-specific and medical in nature, HIPAA-compliance also applies, requiring the use of WPA2 Personal security to prevent unauthorized access. Client device isolation is also necessary, with appropriate exceptions for the on-site servers or monitoring computers that need on-site real-time access to the data. There may also be additional VLANs/SSIDs required for other applications, such as for video surveillance, access control, and Voice over IP. Wi-Fi is the operations infrastructure of the 21st century assisted living facility, and EnGenius’ Neutron Series can get you there. Watch this short video to see how Golden Hill Nursing and Rehabilitation Center deployed the Neutron Series to support their telemedicine and other network-connected applications. Editor’s Note: This updated post was originally published in June 2015.